Powers/Abilities: Brother Brood's mutant powers are uncertain, except that he possesses a number of spines growing from his body. It is unclear if he has any magical powers, if so, he didn't use them, relying instead on optical illusion, his followers, or brute force. He was also described as "Charismatic". Brother Brood has the typical powers of a Brood Queen, the ability to infect others with Brood eggs, chitinous body armor, powerful jaws with sharp teeth, a powerful tail, and clawed hands and feet. He also had complete control of his Broodlings to the point that they seemed to have no real minds of their own. In appearance he more resembled The Firstborn than the typical Brood Queen, and he retained his spines after his transformation. It is strongly implied that he embraced his infection, much in the same way as the mad Kree Grand Admiral Devros. History: (The Exciting X-Patrol#1 - BTS) - In an unspecified Brood foray to Earth, the enigmatic cult leader known as Brother Blood was infected with the egg of a Brood Queen, and experienced a "Spiritual" awakening, coming to believe that becoming one with the Brood was the only truth. 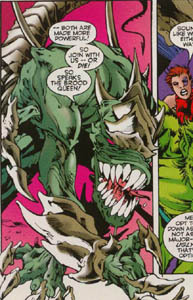 He infected his followers, and , in turn, they kidnapped the metamutant Terra-X for him, but their actions did not go unnoticed, as Shatterstarfire of the X-Patrol witnessed the attack, and along with Niles Cable, traveled deep into his lair beneath Zenosha to rescue her. (The Exciting X-Patrol#1) As Koriand'r and Niles battled the Cult of Brood in an attempt to rescue Terra-X, they were quickly overwhelmed, and Niles chose to sacrifice himself by telekinetically forcing Shatterstarfire to safety. The captured Niles Cable was then brought before Brother Brood himself, who boasted that with Niles in his grasp, Zenosha and the all of earth would fall before The Cult of Brood. Implanted with a Brood egg and chained within the tunnels that housed the cult, Niles Cable was confronted by a vision of his dead wife from the far-future, Raveniya the Healer, who offered him a way to escape the infection...a way that would mean certain death. Meanwhile, Brother Brood was officiating over the "Holy Rebirth" of Terra-X into The Cult of Brood, when X-Patrol arrived and battled their way through his followers to the Brood Pit, where the ceremony was taking place. As the heroes confronted Brother Brood, Terra-X, now calling herself Terra-X The Destroyer, emerged from the Brood Pit, fully under Brood control, and viciously attacked them, only to be knocked unconscious by Elasti-Girl, who had shrunken and entered her inner ear. 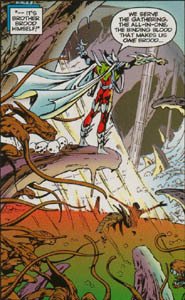 Dial H.U.S.K., in the form of Artemisty Knight, The Bionic Amazon Archer, took aim at the Cult leader on his perch above the Brood Pit, but was surprised when her arrow struck only an empty cloak, he had draped it across a rock as a distraction, sneaking around to attack the heroes from behind. He boasted that one of their "unbelieving number "had already been "converted", and everyone assumed he was speaking of Niles. Janet attempted to attack Brother Brood, only to be blasted away by an infected Niles Cable. As the team faced defeat, "Jericho" spoke of a future in which Niles would lead the Brood to a brief and ultimately doomed, victory, cementing humanities hatred for, and persecution of, mutantkind. Brother Brood then transformed into his Brood Queen form, saying that "When Brood and Mutant join, both are made more powerful !" In the chaos of battle, "Jericho" was revealed to be Niles Dayspring, a younger version of Niles Cable himself, and the elder Niles chose to sacrifice himself , freeing the "Soul-Self" of Raveniya he carried within him. Raveniya then enveloped Brother Brood, apparently killing him. Niles' Techno-Virus killed the nascent Brood within him, and would have killed him as well, had his younger self not telekinatically forced it into remission. As the heroes chatted, The Cult of Brood seemed to simply give up, without their Queen they simply didn't have the will or the intellect to fight. As Niles waxed poetic about the future, Beastling, with a dark look on his face, remarked "The promised, glorious future! Then again, life's just full of surprises...BROOD on that for a while..."
Comments: Created by Barbara Kessel, Brian Hitch and Paul Neary. 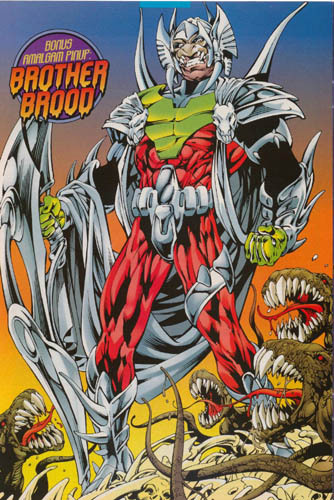 Brother Brood is based upon DC's Brother Blood and Marvel's Brood race...Actually, he's apparently just Brother Blood after becoming infected by the Brood. It seems very likely that the "unbeliever" Brother Brood had converted was Beastling, he was off panel while Brother Brood made that statement, and his remarks at the end would seem to indicate that he was Brood. It's unclear what happened to Terra-X and the surviving Broodlings, X-Patrol apparently just left the Broodlings, as they no longer posed any real threat without their guiding Queen. Did Beastling return to lead them? Sadly, it wasn't revealed. I assume that the forsaken Broodlings could have survived with little difficulty if they had a ready supply of prey, such as local wild animals, or the tasty and nutritious citizens of Zenosha. On an interesting note, much of the cult's caverns resembled the skeleton of some huge beast..perhaps an Acanti or Star Shark? Another interesting note: While Brother Brood refered to himself as a Brood Queen, Ferro-Man called him a "King"
Artemisty Knight is based upon the DC Amazon, Artemis and the Marvel character of policewoman/Private Investigator Misty Knight. Brother Brood's followers, all of whom were infected by the Brood. Most likely they had been his followers in the Cult of Blood, and simply followed their master in giving themselves to the Brood. Some also may have been abducted as Terra-X was. They are described in this way: "They have no minds to touch with his (Niles') telepathy, their meager brainpower devoted entirely to will...his (Brother Brood's) will." They were apparently incapable even of human speech, merely making hissing noises.